Apple is going to be added to one of the world's most closely watched stock indicators on March 18, when it is added to the Dow Jones Industrial Average. The biggest public company in the world will be added to the Dow at the close of trading that day, taking the place of telecom company AT&T. The Dow Jones Industrial Average is a collection of stocks, monitored by Dow Jones & Co., which is meant to be representative of the U.S. economy. Today it contains 30 of the biggest stocks in America. When it was founded, it only had 12. Apple will take the place of AT&T, but really the move is coming because of Visa's recent 4:1 stock split, which threw off the balance between sector weightings that Dow Jones tries to maintain in its average. Because the Dow is a price-weighted stock average, its components are changed from time to time when individual stocks are too far outside the median. Apple recently had a 7:1 stock split to lower its stock price to the $100 a share range, right in the line with the average stock price on the Dow, making it an ideal candidate for inclusion. Before that, it would have been far too pricey a stock to be included. "In price weighted indices such as the DJIA, a large change in price of a high priced stock can have a material impact on sector representation in the index and this index change is designed to minimize that impact," Dow Jones said in a statement. 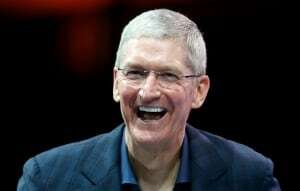 Apple will have a weighting of about 4.3 per cent of the index. That's slightly more than a completely equitable breakdown, which would be 3.3 per cent each for all 30 stocks. On the flip side, AT&T is being dropped from the index because it's stock price has dropped too low to be of significant impact to the Dow. "The DJIA is price weighted so extremely high stock prices tend to distort the index while very low stock prices have little impact," Dow Jones said. Despite being one of the most well-known names in stock markets, the Dow isn't considered the best proxy of the U.S. economy. The S&P 500, with 500 members, is considered a far more representative sample. The move is important for Apple, however, because its inclusion on the Dow means that mutual funds that track the Dow as a benchmark to beat will now be obliged to own or at least follow the company, which could lead to more buyers.